Roshani Chokshi is so sweet! And can we talk about these awesome boots she has on?! I adored this book, y'all. Adored. This story was everything I wanted in a magical competition. My favorite part of The Star-Touched Queen (TSTQ), the predecessor and companion novel to this one, was the beautiful, rich, lyrical writing. I'm so happy to say that A Crown of Wishes (ACOW) had this as well. Alaka was so unique and creative, and reading this story had me feeling like I was just walking around with my mouth agape, taking everything in. But what was missing for me in TSTO was delivered in ACOW. A story that drove me forward and made me want to know its conclusion. I wondered how Vikram and Gauri would would get past the trials put before them, and I cheered them on when they did. My absolute favorite part of this story was the romance. Vikram and Gauri had such delicious romantic tension. Their feelings for each other felt alive in a way that Maya and Amar's never did to me. Throughout this novel I was smiling as Vikram and Gauri traded barbs back and forth. Their banter was everything. So well done! And their characters complimented each other perfectly: Gauri with her physical strength and Vikram with his mental strength. But both similar in their driven personalities. The two of them together made perfect sense. I listened to this one on audiobook and the narrator did a great job. Vikram calls for a tone that is always slightly teasing in its cadence, while Gauri needs to be passionate and direct. The narrator, Priya Ayyar, did a fantastic job delivering both of these. 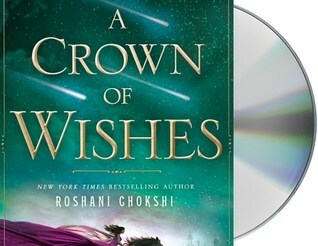 The Star-Touched Queen and A Crown of Wishes came to me at the same time, with the explanation that they are companion stories and that I didn't need to read TSTQ in order to understand ACOW. This is true, but I'm so glad that I did. It was so great to see characters and refer-backs in ACOW to TSTQ and understand them. I'd also read several reviews where people who liked TSTQ preferred ACOW, and I too fall into this category. I like TSTQ. But this book was so well done on so many levels. I adored it. Review of The Star-Touched Queen: http://www.booknerdsacrossamerica.com/2017/05/book-review-star-touched-queen-by.html. Thank you to Macmillan Audio for providing me with this audiobook in exchange for my honest review.